Should I Get a Denture? Have you suffered with dental problems for a long time? Perhaps you’ve wondered if, like your parents, it’s just best to go ahead and have your remaining teeth removed and get a denture. 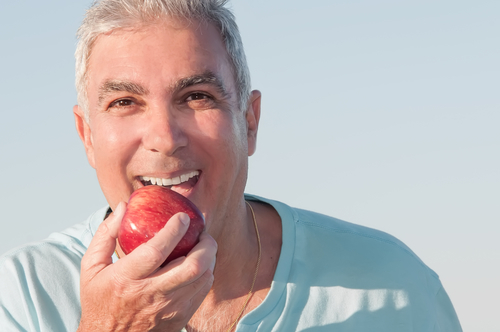 While dentures are beneficial and efficient for replacing all of your teeth at one time, there are a few important things you should keep in mind. Dentures aren’t as “good” as having your natural teeth. For individuals who “just want their teeth out” and get dentures, the adjustment to the larger, removable prosthesis is usually more than what they expected. Other than dental implants, there isn’t any type of tooth replacement treatment that even comes close to being like your natural teeth. A denture can affect your speech. An upper denture will cover the roof of your mouth. Your tongue will need to re-learn how to articulate the speech patterns you’ve been using since childhood. It’s not impossible, but it will take a lot of practice. You may find it’s best to stand in front of the mirror and talk to yourself with your new “teeth” before you’re comfortable going out with friends. It takes time to learn how to eat with a denture. With a denture, your biting forces are cut by over 75%. This means biting and chewing into food is harder to do. Start out by eating softer foods and cutting your meals up in to smaller pieces. A denture is ideal when someone needs to replace all of their teeth at once, or in the most affordable manner possible. Today’s dentures can come in traditional designs or be secured by dental implants, for a stable and comfortable fit all day long. To learn more about dentures and denture alternatives in Wyndham, contact Wyndham Dental to schedule an exam!